Sikorsky was bombing -- and United Tech sold it. Who's next to go on the auction block? 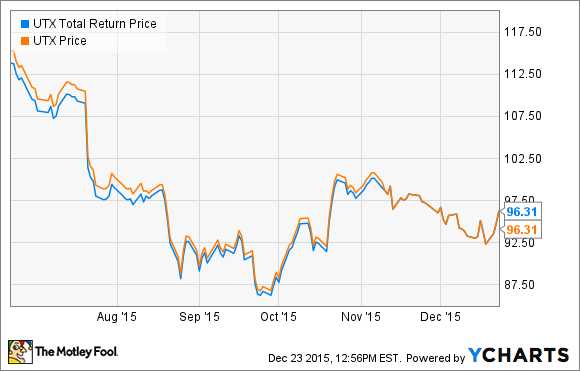 How has United Technologies stock performed since it sold Sikorsky to Lockheed Martin? Two words: Not well. UTX Total Return Price data by YCharts. In June, United Technologies Corporation (NYSE:UTX) made headlines: In a long-anticipated sale, it would offload its Sikorsky helicopters unit to Lockheed Martin -- and collect $9 billion in payment. Some people liked the deal. Others didn't. (Personally, I did not. While United Tech got a good price for Sikorsky, it gave up tens of billions of dollars' worth of future revenues when it let Sikorsky go. And the deal's already working out very well indeed for Lockheed Martin, by the way). Nevertheless, with Sikorsky gone but United Technologies stock still sinking, the question that's rising in investors' minds today is this: Which United Tech business will be next to go on the auction block? What is United Technologies' worst business segment -- and will they sell it, too? Over the past five years, United Technologies' Pratt & Whitney business has sunk from the dubious honor of being "only" its third least profitable business (in 2011) to now its absolute worst business today. At 12.9% operating profit margin, Pratt & Whitney scores 240 basis points below United Tech's profit margin from last year -- and 360 basis points below what United Tech has been averaging so far in 2015. Worse, as the company's second biggest business by revenues, Pratt & Whitney's weak profit margins have an outsize effect on the company's profit margin as a whole -- sapping the strength of businesses such as Otis (the company's most profitable, and arguably its best business today) and Climate, Controls & Security (United Tech's biggest revenue generator, and the one growing profitability fastest). Simply put, Pratt & Whitney is a drag on the business as a whole. And the last time we saw a business segment (Sikorsky) cast in that role -- United Tech sold it. Does this same fate now await Pratt & Whitney? It seems to me that CEO Gregory Hayes has a pronounced preference for products used to outfit big buildings. That means elevators at Otis, and sprinkler systems, alarms, and surveillance equipment at Climate, Controls & Security. Being a former "numbers guy" -- Hayes used to be United Tech's CFO prior to Louis Chenevert's departure last year -- that's only natural. Buildings-related businesses are producing the company's best profits and greatest revenues, respectively, so why not focus on what you're best at? That said, there are serious synergies at work when United Tech's two "also-ran" businesses, Pratt & Whitney and Aerospace Systems, stick together. Both of these businesses focus on airplanes, and one imagines they offer multiple opportunities for cross-selling products among customers. That being the case, selling Pratt & Whitney but keeping Aerospace Systems wouldn't seem to make a lot of sense. Instead, if United Tech decides to offload Pratt & Whitney, it would probably do so as part of a sale of both Pratt and Aerospace to a strategic buyer -- or perhaps even more likely, as a corporate reorganization, breaking United Tech into two more-or-less equal parts. The buildings-related businesses would stay, the planes-related businesses would fly away. At least, that's my read on United Technologies' worst business segment of 2015, and what's in store for it in the future. What's yours?